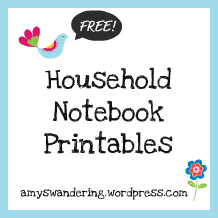 Enjoy this updated MEGA list of FREE household notebook printables! Leave a sweet “Thank You” behind at these sites if you use their pages. I recently helped organize a Benefit Garage Sale and we were blessed to raise $1500! This was my 4th fundraiser garage sale and I have learned quite a few things along the way. Hopefully these tips will help you plan a great sale! We created a private Facebook Group for the planners, but email or meetings will work fine. Plan at least six weeks out to give people time to gather donations. Saturday only? Friday & Saturday? Don’t pick a holiday weekend. They tend to be slower, and it limits your volunteer availability. Check your city calendar for big events. These can help or hurt you, depending on the location of your sale. Check availability if holding the sale at a church building, community center or school parking lot. Ask people to gather unwanted items via word of mouth, email, newsletter, and Facebook. Designate a drop-off location, date(s), and time. Offer to pick up items for the elderly. Have people start collecting plastic grocery bags – bunches! Direct people to a specific area when they are dropping off donations. You don’t want unpriced items getting mixed up with ones already priced. Make signs and tape them to tables or walls so your volunteers know exactly where to place things after they have been priced. Toss little toys and odds & ends in a box. Let kids fill up a bag for a quarter (my friend’s great idea). We used a box of inexpensive bread storage bags. My method is to price it low & let it go! Make several posters that detail your pricing system. Use neon stickers to color-code items that are 25 or 50 cents. Orange or green stickers were 25 cents, and pink or yellow stickers were 50 cents. Who wants hand cramps from all that writing? White Stickers are priced-as-marked (for items $1 & up). Most fundraiser sales will have piles & piles of clothes. Don’t bother pricing them – sell them for $5 a bag! (That is why you need to collect a bunch of grocery bags.) Trust me, you will make way more selling them by the bag!! If someone only wants 1 or 2, sell them for 50 cents each. Place the nicer clothes (like coats, formals, or business wear) on hangers and hang a sign saying they are priced-as-marked. Around lunchtime: lower the clothes to $3 a bag, and either mark some of the more expensive items down or declare everything to be half price. Don’t want to be left with a bunch of stuff at the end or your sale? About 2 hours before the end of your sale, start selling bags for $5 . Allow people to stuff them with whatever they want. (We even handed out trash bags for the bigger stuff.) You would be surprised how much money you can make off of things that probably weren’t going to sell anyway! Start setting up an hour before your opening time. Appoint someone to man the money table – do not leave your cash box alone EVER! Keep paper & pen on hand to help add up purchases. Allow people to bargain, but don’t practically give stuff away first thing in the morning. Have a person or two near the clothes to hand out bags and explain how it works. Tidy up tables throughout the day. Most people don’t want to dig through a jumbled mess. Have a dinner plan in place. You will be too tired to cook when you get home. Check to make sure there are not laws against these in your city. Now sit back, admire your hard work, and give thanks to God for a wonderful day of Fellowship!! Do you have any tips to add? Share in the comments! We are having a HUGE Benefit Sale on Saturday, March 24th, from 7:00 to 4:00. The tables are piled high and the donations are still coming! Get here early – it is priced to sell!!! It has been slow on this little blog o’mine for the last couple of weeks, but real life has been crazy busy!! We took a week off for Spring Break and I tackled our scary disorganized garage. During this time, we also hosted an Irish Tea and High Kings sing-along for our Bible study group. A brilliant time was had by all! Last week was a blur of preparation as I helped organize a HUGE benefit garage sale. It was a wonderful success and we raised $1500!! 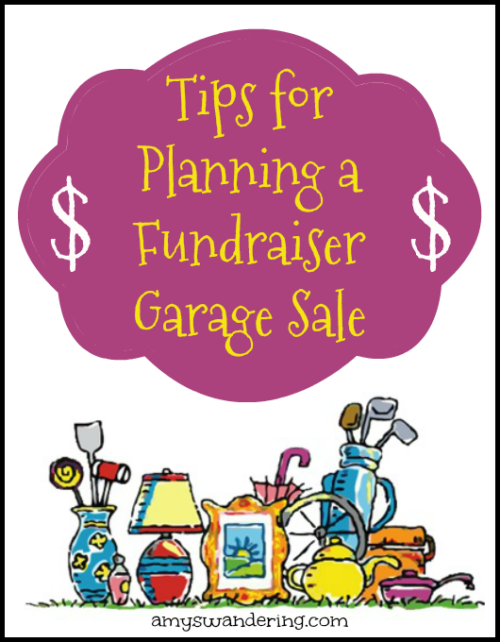 ~ For Works For Me Wednesday, I will be sharing my tips for pulling off a fundraiser garage sale. ~ I didn’t realize that it had been 2 YEARS!! since my last post on Household Notebook Printables. I updated the list last year, but didn’t re-post. I am working on a new-and-improved list that you are going to love!! Scholastic Teacher Express is having a 3-day $1 sale on their eBooks. We really like the Hands-On History books, so I was thrilled to buy some more! Cursive Writing made Easy & Fun! Cursive Writing Practice Pages With a Twist!